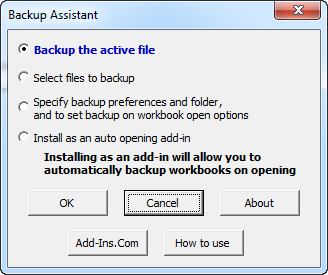 The Backup Assistant add-in for Microsoft Excel is designed to help you make backup copies of your workbooks before you make changes to them. One of its most useful features is to prompt you to backup a file immediately after it is opened! It is compatible with Microsoft Excel 2007 to 2019 and Office 365. Eliminate the worry about messing up a file and not having an up-to-date backup. One of the college students working for us, Sarah, put a copy of the Backup Assistant on her computer. She had it set to backup files once a day, upon opening. At the end of summer, she returned to school. Near the end of the Fall semister, she let one of her workgroup work on their excel project workbook that was on her PC. He ended up totally trashing the file. They thought that all was lost and they would fail the semister project as a result as the PC had not been backed up.. Then Sarah realized she still had the Backup Assistant running in Excel, automatically backing up files once a day when they were opened. She quickly opened the backup that was made that day and found that they had not lost their work after all! The first two options allow you to either backup the active file or to backup a group of files. The third group option allows you to set backup preferences and on workbook open options. Backup on open is a very powerful feature. We use it to backup all of our workbooks when they are first opened each day. The backups are saved to a target folder with the file name and the date. For example, "Sales Data 2010 09 23.xls". The backup frequency: daily, each time opened, after confirmation, or not at all. The Backup Assistant is completely menu driven. The menus are easy to follow and use. To help you learn how to use the features of the Backup Assistant, there is a help and exercise file to give you hands on practice. To open it, just click on the How to use button on the main dialog.